Alice Blue, the latest project in The Heights from chef and restaurateur Claire Smith, is ready to debut what may be Houston’s favorite meal: brunch. (It’s located at 250 West 19th Street, in the space that used to house Smith’s previous restaurant, Shade. The name references the pale azure favored by Theodore Roosevelt’s daughter, Alice.) 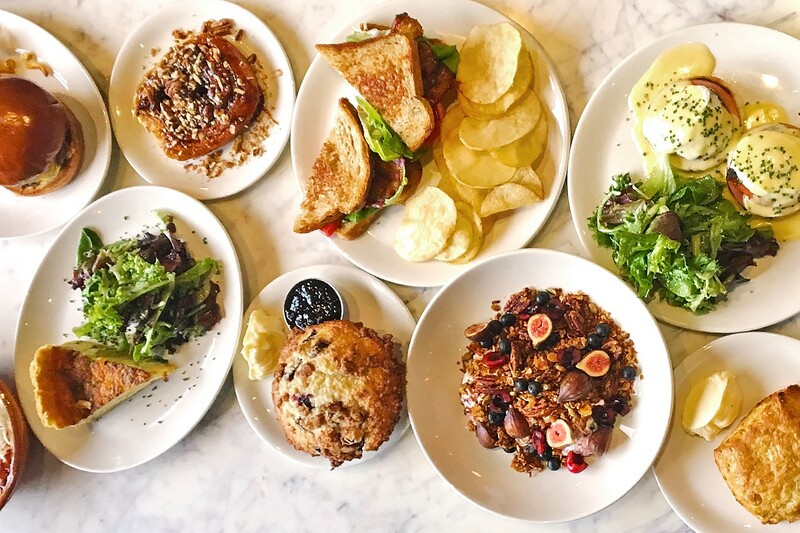 Weekend brunch service starts this Saturday, July 1 and runs from 10 a.m. to 3 p.m.
From there, diners can move on to heartier fare, both sweet and savory. Those still in breakfast mode might consider quiche with bacon, leek and gruyere (with a little salad on the side); or the Challah French Toast with peaches, blackberry jam, whipped cream and maple syrup. Guests ready to move on to the midday meal might consider a burger or the graceful Niçoise Salad adorned with olives, potatoes, artichoke, green beans, a soft boiled egg and poached tuna. A fancy housemade granola with yogurt and honey sports fruit that is in season right now: cherries, blueberries and figs. Of course, brunch would not be brunch without appropriate drinks alongside, and beverage consultant Sean Jensen (formerly of The Hay Merchant and Public Services Wine & Whisky) has been sure to provide plenty of excuses for day drinking. Selections on the “liquid brunch” list include hard-core classics like the Kir Royale, Champagne Cocktail, absinthe-tinged Death In The Afternoon, Bloody Mary (or Maria), and, of course, a Mimosa. For diners who went to go off the beaten path, there are also “Daytime Wine” selections (Moscofilero from Greece and tart Txakolina from Spain are among the intriguing choices) and a variety of “Breakfast Beer” (because there are never too many reasons to drink Orval Trappist Ale or Saint Arnold Raspberry AF). The entire brunch menu at Alice Blue can be viewed online. I’m sad to see the fried green tomato BLT didn’t transfer over from Shade, glad I got one last sammich before the change…….looking forward to trying the new menu otherwise!